Dr. Ronald Bush is board certified in four surgical specialties: surgery, thoracic surgery, general vascular surgery, and laser surgery, which gives him a high level of expertise not often found in a community setting. His knowledge and skill as a surgeon qualify him as a fellow in the American College of Surgeons. Dr. Bush trained in general surgery at Indiana University and completed a fellowship in vascular surgery at Baylor University, followed by a cardiothoracic surgery fellowship at Walter Reed Army Medical Center. 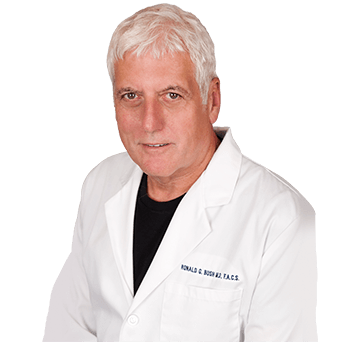 Since 1999, Dr. Bush has devoted his practice solely to the treatment of venous disease. He has performed more than 6,000 venous surgeries in the office setting and to date has performed thousands of ELAS (endoluminal laser ablation) procedures with no complications and a 98 percent success rate. Physicians throughout the world have visited and have been trained by Dr. Bush. Many of the new procedures now performed in the ambulatory treatment of varicose veins have originated in part from his clinical studies. In addition, Dr. Bush is the author of numerous scientific papers and holds patents for surgical instruments.